Iskanian v. CLS Transportation Los Angeles, LLC, 59 Cal. 4th 348 (2014), petition for cert. filed, No. 14-341 (September 22, 2014). On September 22, 2014, CLS Transportation Los Angeles, LLC (“CLS”) petitioned the highest judicial body in the United States for a writ of certiorari to review the California Supreme Court’s June 23, 2014 decision – finding that Private Attorneys General Act (“PAGA”) claims cannot be waived in connection with an employment arbitration agreement because the employee is acting as a proxy for the state in bringing the PAGA claims. Notwithstanding the U.S. Supreme Court’s almost incessant enforcement of the FAA, has the California Supreme Court found the FAA to have a soft underbelly? 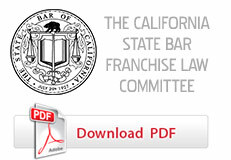 Because arbitration provisions encompass much of our day-to-day activities as franchise practitioners – both in litigation and drafting – the California Supreme Court’s analysis and narrowing of the all-encompassing FAA, followed by CLS’s subsequent petition to the U.S. Supreme Court, provides us with a solid case study for review and discussion. CLS is a limousine service company. From March 2004 to August 2005, Respondent Arshavir Iskanian worked as a chauffeur for CLS. During his employment, Iskanian entered into a “Proprietary Information and Arbitration Policy/Agreement” as part of a $1,350 settlement with CLS. The arbitration agreement provided that “any and all claims” arising out of the employment relationship would be submitted to binding arbitration before a neutral arbitrator, and that the arbitration “shall be governed by and construed and enforced pursuant to the Federal Arbitration Act […] and not individual state laws regarding enforcement of arbitration agreements.” Also, by accepting the settlement amount and entering into the arbitration agreement, Iskanian agreed to waive his right to participate in class and representative actions. Notwithstanding the arbitration agreement or class action waiver, on August 4, 2006, Iskanian filed a class action lawsuit against CLS in California Superior Court. The lawsuit asserted various wage and hour and business expense reimbursement claims. In response, CLS moved to compel arbitration pursuant to the parties’ agreement. The trial court agreed, issuing an order compelling arbitration. Iskanian appealed. On November 21, 2007, while his appeal was stalled out in the Court of Appeal, Iskanian filed a separate, representative action under the PAGA alleging violations of the California Labor Code. In short, the PAGA authorizes an employee to pursue a civil action on behalf of the state against the employer for Labor Code violations committed against the employee and fellow employees, with most of the recovery of the lawsuit going to the state. Both lawsuits were later consolidated and, on September 15, 2008, Iskanian filed a consolidated first amended complaint. After engaging in some discovery, Iskanian moved to certify the class, and CLS opposed the motion. On October 29, 2009 – more than three years after the initial complaint was filed – the trial court granted Iskanian’s motion to certify the class. The Court’s decision in Concepcion explicitly overruled Discover Bank v. Superior Court (“Discover Bank”) – the decision upon which Gentry was based. Following the Court’s decision in Concepcion, on May 16, 2011, CLS renewed its motion to compel individual arbitration of Iskanian’s claims. The motion to compel was again granted by the trial court and the class claims were dismissed with prejudice. Iskanian’s second appeal ensued. On June 4, 2012, California’s intermediate appellate court unanimously affirmed the trial court’s order compelling arbitration, concluding that Concepcion invalidated Gentry. In its ruling, the court held that the FAA precludes state laws that withdraw claims from arbitration, requiring Iskanian’s PAGA claims to be arbitrated individually. Also of note, the court declined to follow a National Labor Relations Board (“NLRB”) ruling that class action waivers in employment adhesion contracts violate the National Labor Relations Act. Thereafter, Iskanian petitioned the California Supreme Court for review. The court granted his petition. Third, Iskanian argued that CLS had waived its right to compel arbitration “by failing to diligently pursue arbitration” and, instead, chose to pursue substantial pre-trial discovery. Finally, because the arbitration agreement at issue required Iskanian to waive not only class actions but also “representative actions” – i.e., representative actions brought under the PAGA – Iskanian argued that the FAA does not preempt such representative state law claims. First, the court nearly summarily disposed of Iskanian’s first argument finding that, “the fact that Gentry’s rule against class waiver is stated more narrowly than Discover Bank’s rule does not save it from FAA preemption under Conception.” Instead, “Concepcion holds that even if a class waiver is exculpatory in a particular case, it is nonetheless preempted by the FAA.” Therefore, “in light of Concepcion,” the court found that the FAA preempted Gentry. Next, the court, again “in light of Concepcion,” overruled the NLRB’s contrary finding that arbitration agreements may not require an employee to “forgo the substantive rights afforded by the statute.” Similarly, the court found that the National Labor Relations Act did not take precedence over the FAA with respect to the enforceability of class action waivers in employment arbitration agreements. The court also found that a PAGA litigant’s status as the agent for the state “is not merely semantic; it reflects a PAGA litigant’s substantive role in enforcing our labor laws on behalf of state law enforcement agencies.” As a claim brought on behalf of a state agency, a PAGA action is not preempted by the FAA because the FAA “aims to ensure an efficient forum for the resolution of private disputes, whereas, a PAGA action is a dispute between an employer and the state Agency.” Citing to the FAA’s legislative history and the U.S. Supreme Court’s FAA jurisprudence, the court concluded that the FAA was intended for “private disputes,” and not to circumvent actions by a public enforcement agency. In sum, the California Supreme Court held that Iskanian’s class action claims must be arbitrated while the PAGA action could go forward in Superior Court. As mentioned above, on September 22, 2014, CLS petitioned the U.S. Supreme Court for a writ of certiorari to review the California Supreme Court’s decision as it relates to the PAGA claim. Second, CLS argues that an employee’s waiver in an arbitration agreement of a collective or “representative action” under the PAGA is not so distinguishable from a “class action” waiver that it is immune from the otherwise preemptive effect of the FAA. In other words, there “is no principal difference” between a class action and a representative action under PAGA” – thus, the court was wrong in treating them differently in its application of the FAA. Third, CLS argues that the PAGA action is not “a type of qui tam action” – i.e., an action that cannot be waived by an arbitration agreement under the premise that, “a law established for a public reason cannot be contravened by a private agreement.” Again, CLS contends that all state laws are predicated on a public reason, and the Court has never wavered from finding such laws invalid when they frustrate the FAA. Fourth, CLS argues that, even if the PAGA action is a “qui tam action,” Congress has not allowed for a PAGA exception to the FAA. Until Congress has decided otherwise, PAGA – as a “qui tam action” or not – is preempted by the FAA. Finally, CLS petitions the Court to overturn the California court’s decision under the principle that the “state proxy” distinction will encourage other states to enact legislation that undermines the FAA. While we will likely have to wait for some time before hearing from the Court, the California Supreme Court’s decision shows that – even in light of Concepcion – the debate concerning the breadth of the FAA is alive and well. This case report was prepared by Kevin A. Adams (kadams@mulcahyllp.com), of the Irvine law firm of Mulcahy LLP. Mulcahy LLP is a boutique litigation firm that provides legal services to franchisors, manufacturers and other companies in the areas of antitrust, trademark, copyright, trade secret, unfair competition, and franchise and distribution laws. Gentry v. Superior Court, 42 Cal. 4th 443 (2007). California Labor Code § 2698 et seq. Iskanian v. CLS Transportation Los Angeles, LLC, 59 Cal. 4th 348, 360 (2014); see also, Arias v. Superior Court, 46 Cal.4th 969, 980-81 (2009)(“In September 2003, the Legislature enacted the Labor Code Private Attorneys General Act of 2004 […]. The Legislature declared that adequate financing of labor law enforcement was necessary to achieve maximum compliance with state labor laws, that staffing levels for labor law enforcement agencies had declined and were unlikely to keep pace with the future growth of the labor market, and that it was therefore in the public interest to allow aggrieved employees, acting as private attorneys general, to recover civil penalties for Labor Code violations, with the understanding that labor law enforcement agencies were to retain primacy over private enforcement efforts.”)(Internal citations omitted). AT&T Mobility LLC v. Concepcion, 131 S. Ct. 1740 (2011)(internal citations omitted). Iskanian v. CLS Transportation Los Angeles, LLC, 59 Cal. 4th at 364 (citing AT&T Mobility LLC v. Concepcion, 131 S. Ct. at 1753). Discover Bank v. Superior Court, 36 Cal. 4th 148 (2005). Iskanian v. CLS Transportation Los Angeles, LLC, 59 Cal. 4th 348, 363 (2014)(citing Brewer v. Missouri Title Loans, 364 S.W.3d 486, 489, 494 (Mo. 2012). Iskanian v. CLS Transportation Los Angeles, LLC, 59 Cal. 4th at 363 (internal citation omitted). In re D.R. Horton Inc., 2012 NLRB LEXIS 11 (Jan. 3, 2012). Iskanian v. CLS Transportation Los Angeles, LLC, 59 Cal. 4th at 3367-368. Iskanian v. CLS Transportation Los Angeles, LLC, 59 Cal. 4th at 372. Id., p. 384 (emphasis in original). Iskanian v. CLS Transportation Los Angeles, LLC, 59 Cal. 4th 348 (2014), petition for cert. filed, No. 14-341, p. 15 (September 22, 2014). Iskanian v. CLS Transportation Los Angeles, LLC, 59 Cal. 4th 348 (2014), petition for cert. filed, No. 14-341, p. i (September 22, 2014).